When your girlfriend bets that you can’t commit to the gym, it’s time get serious! That’s what happened to Ruslan, who responded by gaining 50 pounds of chiseled muscle! I was a student in Holland, living the European student life, with a limited amount of cash to spend monthly and no facilities such as a car, pool, gym, or tennis court; unlike what I had back at home in Dubai. I realized that when I was back in Dubai I didn't even use any of those things (pool, gym) that were right in my home. At one point, I decided to go back and I told myself and my girlfriend at the time that I would hit the gym once I was back and get in shape, although I was always just lean, never overweight. She just giggled at that statement saying, "Yeah, right." So I made a bet with her that I would follow through and get results. This was the initiator. I got to the gym, started training, and months later as the results started to come in I got hooked. Ruslan pushed his chips all in and won decisively. I guess I just fell in love with the sport and with everything that comes along with it. That is what helped me stay on track and not quit. I had the time, access to a gym, and was able to buy supplements. There were no obstacles in my way, plus I was enjoying it. However, at one point I had to have back surgery (not related to my training). This caused me to stop training for around 6-8 months. Obviously, after I was healed there was no visible trace of me ever going to the gym. This was a great demotivator, and it took a lot of willpower to get myself back in there. But I went back to the gym and started training again. 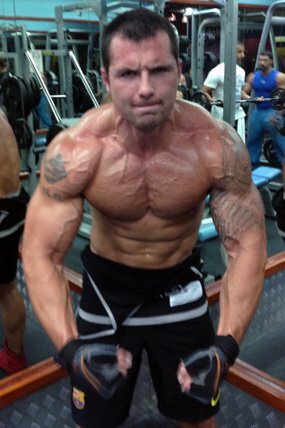 Bodybuilding.com really helped me too. I did not know anyone else who was into weightlifting and or had experience, so I had no one to learn from or even ask for advice. Bodybuilding.com was my number one source! I was reading articles and info on nutrition, exercises, training programs, and spent time on the Forum asking people for advice. To be honest, now I realize that the first two years were kind of a waste. If I knew what I know now, I would have reached these results much quicker, but I'm glad I had to learn everything on my own and not just pay some trainer and follow what he said. It took me a long time to understand and realize that the most important thing in this sport is the nutrition. I would eat when I wanted, and what I wanted, and thought all that mattered was that I was training. Then I joined another gym that had experienced guys training in it and then drilled it into my head that I need to EAT. So I started to eat 5-6 times per day, a high-protein based diet, and I just blew up. I started seeing completely different results, which opened my eyes on the importance of nutrition. Every time people come up to me and ask what I did to get this big, I always tell them it's all about the food. I say, "Bodybuilding is not about the one and a half hours you spend in the gym, it's about the other twenty-two and half hours in your day." So, how I did it? Persistence, motivation and knowledge. I change my supplements constantly, simply because I like to try different brands. But these are the supplements I take constantly: whey protein, glutamine, BCAAs, multivitamins, and Omega 3-6-9. Sometimes I take another protein shake right before bed, depending on when my last meal was. At the moment my stack is: MusclePharm Combat Powder, Assault, and Recon together with Controlled Labs Orange Triad, and Omega 3-6-9. I don't really count my calories; I just concentrate on eating clean 4-6 times per day. I'm not able to eat 5-6 times per day due to work and sometimes I'm just too busy and on the move all the time. I do snack throughout the day, mainly on fruits like bananas, grapes, and pineapple. My training routine changes all the time. In the beginning, I did 3 sets of 10 reps. Now, I mainly do 4 sets of at least 10 reps, up to 15. It's really about experience and learning to listen to your body and understand what works best. Eat clean, train mean, and stay lean!